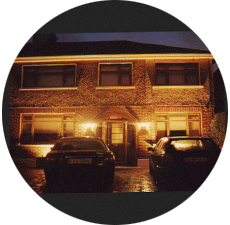 Auburn is a family-run bed and breakfast, ideally situated on Dublin's northside, in the leafy suburb of Drumcondra. Bord Failte approved and beautifully decorated throughout, we are close to Dublin Airport, Ferryport and the M50 Motorway. A warm welcome awaits you when you arrive at Auburn Guesthouse, which is set on the fringe of the exclusive residential area of Castleknock. It has an ideal gateway location for visitors who wish to explore Dublin City and its environs, or for the travellers who wish to view Ireland's countryside in comfort. The guesthouse is situated less than 6km from Dublin's O'Connell Street and has immediate accessibility to the M50 Motorway. Auburn Guesthouse is situated on its own gardens, with ample car parking and is remarkably secluded, private and secure. Situated 15 minutes from the city centre, it has immediate accessibility to the M50 motorway. 10 minutes from Dublin airport. Close by fishing, horse riding and golf course. We offer high-grade accommodation, equipped with everything the discerning guest may require. The neighbourhood is complimented by the Phoenix Park and a number of green areas and Golf Courses are all within immediate reach. 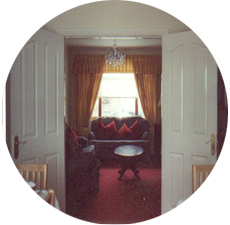 The foyer/reception and dining areas combine practicality with a sense of welcome and comfort, the essence of Auburn Guesthouse. You may wish to relax, listen to music, read or simply chat to our other visitors in our comfortable lounge area. Whatever the purpose of your visit to the Dublin region may be, you can be assured of an enjoyable and pleasant stay at Auburn Guesthouse with Geraldine and Jim. All rooms are en-suite and tastefully furnished with the highest quality modern conveniences. 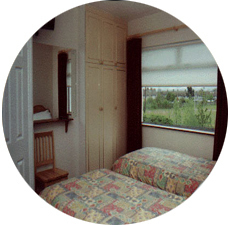 The decor is restful and warm, while the rooms are large, spacious and extremely comfortable. Features include multi-channel television, direct-dial telephone, hair dryers and trouser presses, tea/coffee facilities. Rooms with Queen size beds and Jacuzzi are also available. From this unique location you can enjoy many wonderful features Dublin City and County have to offer. Some of these include the Phoenix Park, Irish National Museum at Collins Barracks, the Irish Writers Museum at Parnell Square, Guinness Hop Store, Trinity College and of course no visit to Dublin would be complete without an evening at one of our famous pubs or theatres. Auburn Guesthouse is also an ideal location for horse riding, golfing, coarse fishing, walking - these can be arranged on request. Local Golf Courses include St Margarets, Luttrellstown Golf Club, Portmarnock Golf Club and Elmgreen Golf Centre. From Dublin Airport: Take the M1 towards Dublin City. Take the first exit to join the M50 - Southbound - to the Castleknock/City exit. At the next roundabout turn right on the smaller roundabout. Auburn Guesthouse is on the right. From O'Connell Bridge: Drive up the Quays and straight through Phoenix Park. Drive for about 1/2 Km and turn right at the traffic lights, down Auburn Avenue. At the end of the avenue, turn left and Auburn Guesthouse is on the right. From Irish Ferries terminus (North Wall): Again drive up the Quays and follow directions as per O'Connell Bridge. From Dun Laoghaire Harbour: Take N11 from Dun Laoghaire to Dublin City centre/O'Connell Bridge. From here proceed as above. The M50 is accessible by all National Roadways (N2, N3, N4, N7 and N81). Buses to the city run every 12 minutes and return from the Middle Abbey Street. These include 22B, 38, 39 and 70.